The emerald ash borer (EAB) is an Asian insect pest that are fatal to ash trees. 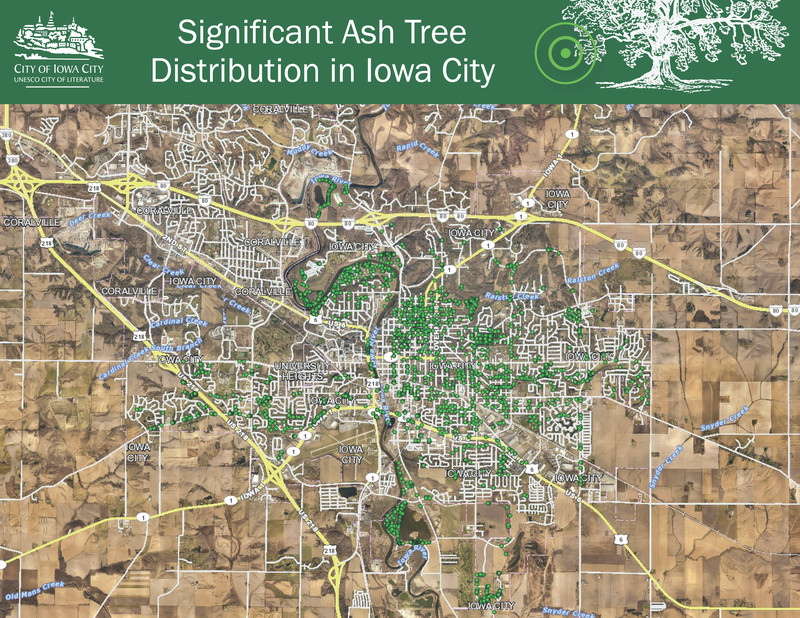 There are approximately 2,000 ash trees on public property either in parks or in right-of-ways within Iowa City. The City will not examine or determine a course of action for any trees on private property, and will leave those decisions to property owners. 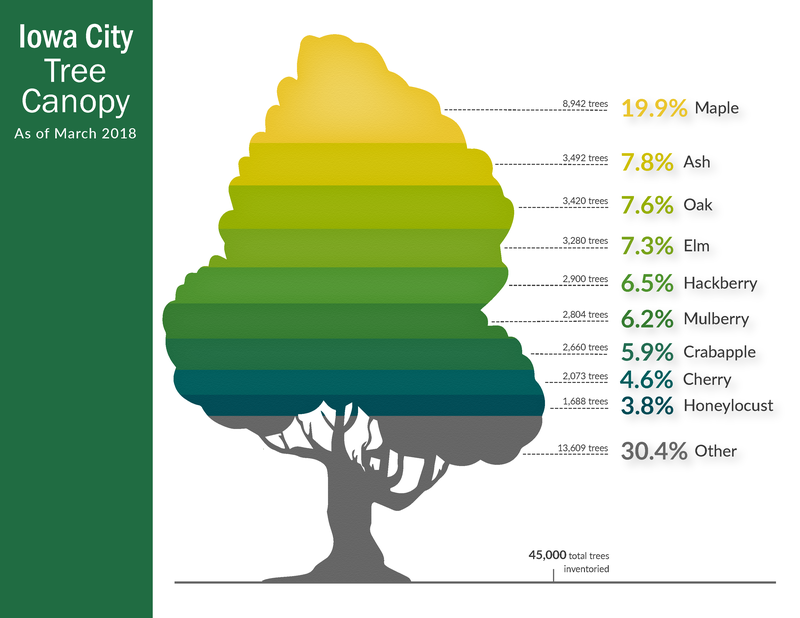 For more information on the City's tree ordinance, view the City Code. If a tree is exhibiting EAB symptoms, contact the Iowa Department of Agriculture and Land Sterwardship State Entomologist at 515-725-1470 or entomology@IowaAgriculture.gov. If you have a tree that is not exhibiting symptoms of EAB, but would like your tree to be evaluated, contact a certified arborist. 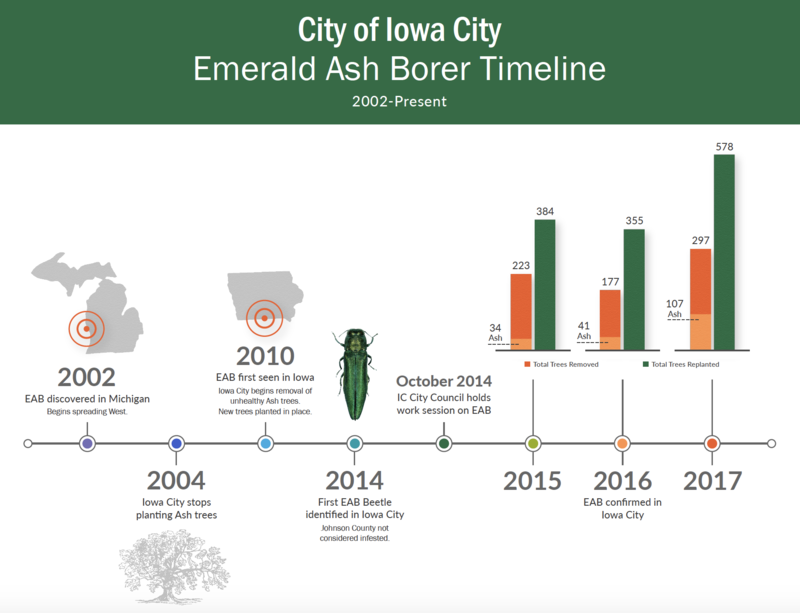 Watch this video to learn more about the history of the emerald ash borer, as well as the response plan the forestry division is putting into action as this invasive beetle moves into Iowa City. Iowa City Parks and Forestry staff provided an update to the City Council in September 2018 about the status of the Emerald Ash Borer in Iowa City and recommended steps to address the ongoing situation. An update to the Emerald Ash Borer Response Plan was also provided in 2016. In 2016 and 2017, a team of arborists from Plan-It Geo, a geo-technical firm from Colorado, conducted a tree inventory, gathering data on the City's urban forestry, as well as mapping and cataloging the tree species. This inventory will yield information and mapping tools to help the Parks and Forestry Division better manage and maintain Iowa City's urban forest.